Edinburgh’s radio industry gathered at a special event to celebrate the city’s vibrant radio scene and the upcoming launch of a new digital radio transmitter located at Edinburgh Castle which will boost digital radio coverage across the city. The event, This is Radio, took place at The Place Hotel this evening, and was attended by over 100 delegates from BBC, commercial, community and student radio from Edinburgh and beyond. The new transmitter at Edinburgh’s famous castle marks the completion of a programme of work transforming the availability of local radio services on DAB digital radio throughout Edinburgh and the surrounding area with the launch of three new transmitters at Athelstaneford, Earls Hill and, finally at the end of March, Edinburgh Castle, increasing coverage to 94% of households, compared to 80% in 2013. This means that 250,000 more listeners will be able to receive the great range of 11 stations available on local DAB in the Edinburgh area - BBC Scotland, Forth 1, Forth 2, Capital Scotland, Heart Scotland, Kissfresh, Magic Soul, Absolute Classic Rock, Absolute 90s, Smooth and The Hits. In Edinburgh, 58% of adults own a DAB digital radio, and there are now 62 radio stations broadcasting in the city including national stations such as BBC Radio 6 Music, BBC Radio 4 extra, Capital, Heart 80s, Magic and Absolute Radio; a further 19 broadcasting to Central Scotland including 103.1 Central, BBC Radio Nan Gaidheal, Scottish Sun 80s, Rock Sport, Go Radio and talkSPORT Scotland; as well as the 11 stations available on local DAB. Edinburgh’s This Is Radio special event was organised by Digital Radio UK and Radio Academy Scotland to celebrate the growth of digital radio in Edinburgh. 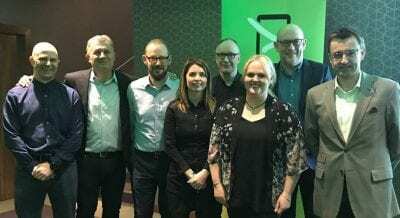 The event was hosted by Stuart Barrie, Chair of Radio Academy Scotland and the agenda featured a line-up of high-profile speakers from leading radio broadcasters, looking at radio’s past and future in Scotland. Speakers included Graham Bryce, Group Managing Director of Bauer City Network; Gareth Hydes, Commissioning Editor for Radio, Music and Events, BBC Radio Scotland; Richard Bogie, General Manager of News Scotland and Carol Wyper, Marketing Manager, Scottish Sun; Adam Findlay, Managing Director, New Wave Media ; Kevin McAuley, Commercial Director of Rock Sport Radio; Isla Munro, Teaching Fellow at the University of Edinburgh; radio historian David Lloyd; and award winning TV and radio presenter and journalist, Bauer’s Cat Harvey. Attendees heard that Edinburgh is a dynamic and iconic radio market which has seen considerable investment in expanding DAB radio coverage and launching new DAB stations. Additionally, the success of the new generation of audio devices such as the Amazon Alexa and other voice controlled speakers, where most audio listening is radio, is further boosting radio listening. Ford Ennals, CEO, Digital Radio UK, said: “Radio listeners in Edinburgh love their local stations so it’s great news that the completion of the new digital transmitters will mean that more people will be able to listen to their favourite stations on DAB. There are now 62 DAB stations available in Edinburgh with a great range of different music stations as well as sports and news stations so it is no wonder that radio listening is growing in the area."